Yesterday I had to take the day off from work because my child’s daycare had school conferences. On conference day her classroom closes completely and I’m forced to take the day off to watch my daughter. On the one hand, this is seen as an inconvenience. I can’t go to work; there are things that need to be done, etc., etc. Obviously the flip side is that I have the opportunity for a full day of quality time with my child. Fortunately for us, it was a gorgeous day out and we spent the whole morning outside. After the morning conference and a bike ride to breakfast, we ended up at a playground. As most children do, my daughter loves playgrounds. “Yes, honey. First we’ll eat and then we’ll go to the playground.” For the hundredth time. Finally we got to the playground. For the first time in months, perhaps even years, I was able to sit and just enjoy the out-of-doors while my daughter played. She was in heaven digging in the sand, swinging on the swings, watching the other children. I was in heaven doing nothing. After a long time of enjoying this peaceful bliss of nothingness, I started thinking. What other opportunities are there for her out here? What can I show her in the world that goes beyond the man-made play structure? It was then that I noticed the field of dandelions. I suggested that she and I go look at the flowers. It was hard to tear her away from all the fun she’d been having, but she obliged and went out to explore. We went over to the field of dandelions and sat to look at them. I had a flashback to some of my earliest and most delightful memories. I used to love to sit in a field of dandelions and just pick them. 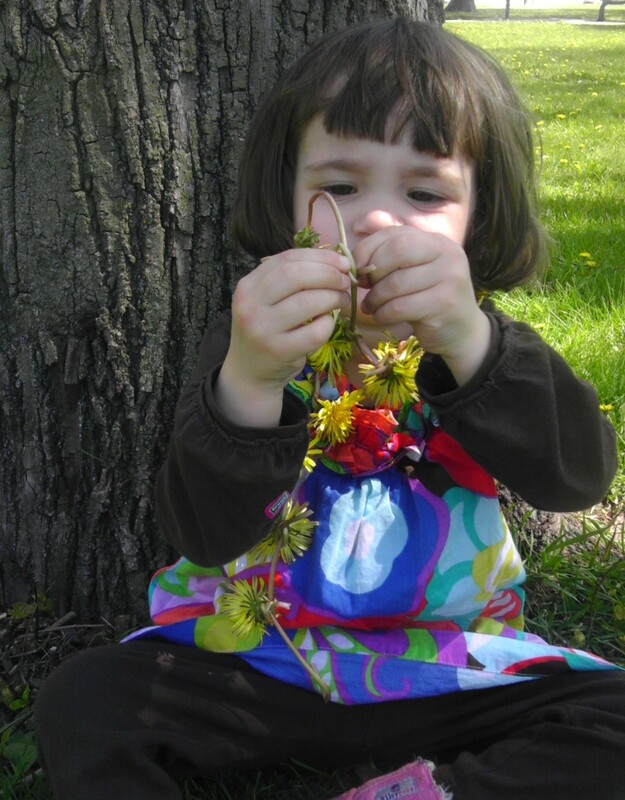 When I got older I would sit with my other little girl friends and we would make long chains of dandelions and turn them into necklaces. It’s a simple story but one filled with beauty and delight, in the wonder and curiosity of exploring something new. Through the lens all I could see was that she wasn’t looking at me. As I look back at the pictures now, I see now why she wasn’t looking at me. It wasn’t that she wasn’t looking at me it was that she was too busy. She was actively engaged in this new wonder of the world. She was looking down at the wonderful chain of flowers falling around her neck. She was in her own world, in a place beyond the playground. This is a beautiful story. I am glad it had a happy ending. As I read the part about the dandelions, it reminded me of some personal trauma, and I thought you were going to talk about, the truck, and the sign. The pesticide truck, and the sign saying to keep pets and children off the grass… Sadly, this has happened to me more than once when I tried to enjoy the outdoors with my child. I am glad it did not happen to you. Oh dear Lord. Thank goodness, no pesticide sign. A mother’s worst nightmare. There was another little girl there, too. She was about 10 or so, and she was making a bouquet. It was really cute. Yes. Sorry about my PTSD. 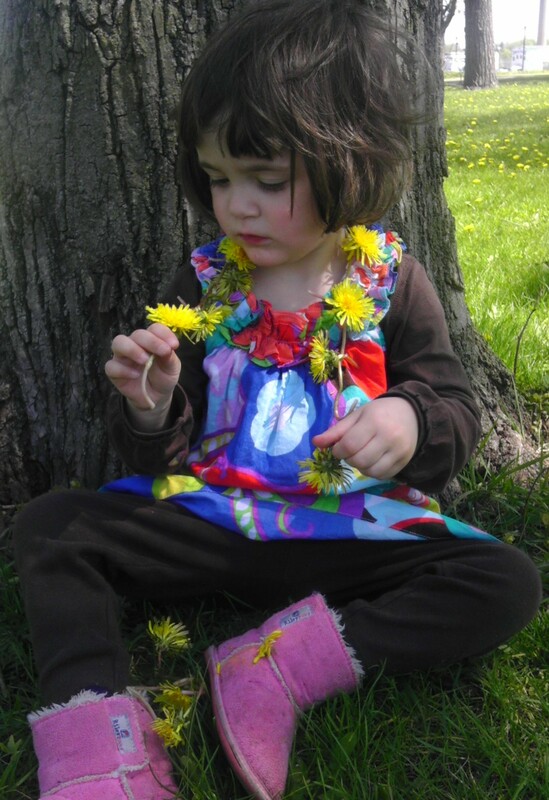 I pray and work for the day when we can all make dandelion necklaces without fear. Love gthe pictures and the story. No more pesticidies, Auntie Linda! They go into the rivers and the streams and the rainwater. You can get a good tool to dig up dandelions if you really don’t want them around! Aww…that’s so sweet. Nihal loves his mama! What a wonderful and tender mother-daughter experience. 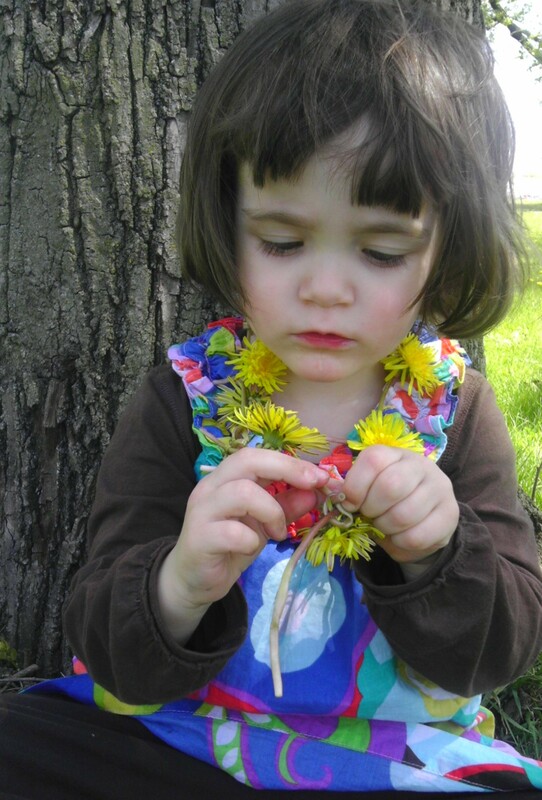 Perhaps one day she too will show her daughter how to make a necklace from dandelions and reminisce about this day –the whole day her mother spent with her; and showed her how to make a necklace from flowers too. Thanks for that thought, Randy. I’m sure we are developing some sweet memories together. And that’s what it’s all about, right? More adorable by the moment! The pictures came out wonderfully 🙂 I love your sweet story, thanks for sharing. I’m glad you enjoyed it. It’s amazing how a child’s creativity can be so simple yet so meaningful.